In these new, more frugal times, making your own Christmas gifts no longer has that rather ‘skin-flint’ vibe. Nowadays, when you hand over a delicious jar of home-made chutney or something you’ve knitted to your friends and family for Christmas, you’ll look like a creative, generous person that understands the value of making an effort instead of just clicking a few buttons on an online shop. Now, before we move on to suggestions as to what you can actually make, let’s have a few words about quality. Making your own Christmas gifts is not really about saving money, although you will do anyway, it’s about giving something wonderful and individual. So, if you’re giving home-made jam, for example, take time to find pretty jars, write (or print off your computer), a label really neatly and add a little extra flourish with a ribbon or piece of raffia. If giving a little craft gift, choose a colourful, stylish box and add plenty of coordinating tissue paper. Don’t just shove it in a brown envelope from work and put it through the franking machine! What you decide to give your friends and family as home-made Christmas gifts depends on your skills. You don’t want to give a bad version of anything, so if your sloe gin making is far superior to your cake baking, get sloe picking! You need to be pretty good at making handicrafts to be able to give your home-made gifts for Christmas, so, difficult as it is, try to be objective about your items. There is nothing more embarrassing than being given a terribly-made knitted scarf and having to fake your delight, seconded only by having the wear the thing for every subsequent visit to avoid offence! That said, it is lovely to have something unusual and hand-made, but just don’t put pressure on the recipient to tell you how much they love it in front of everyone on Christmas morning! Whatever your skill, you’re sure to be able to make something that will be appreciated. Just because the more ‘usual’ home-made Christmas gifts tend to be food or craft gifts, if these are not your strong suit, think about what is and create something special. If you’re good at creative writing, you could write a short Christmas poem that you can present nicely on a festive card? You could even frame it. Or you could make a scanned-and-printed photo album. How about a little ‘cheque book’ of favours, like babysitting for your nieces or nephews, or cooking a meal for your mum and dad where you buy all the ingredients and wash up afterwards! 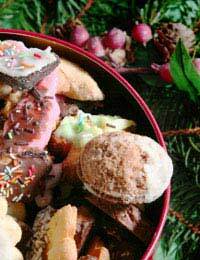 Take a look here for some make your own Christmas hamper ideas.